While I was writing the earlier post, Gretchen was happily occupied in the kitchen making scones. This was her first effort and they are fantastic! We have always enjoyed eating them at our favorite local coffee shops and she has been looking for a recipe that appealed to her for many months. The confluence of an ice storm and the recent arrival of the March issue of Southern Living provided the perfect opportunity to try out the recipe on a willing subject. Since I took this picture, I chomped off the end of one of these scones and they are exactly what I have wanted for years. Slightly sweet, with lots of currants and they have the perfect fresh scone texture, firm but crumbly when you bite into them. I know that scones can be eaten when they have assumed the consistency of well-fired bricks. I have done this on a number of occasions and lived to tell the tale. I am not sure that scones even have a sell-by date, as long as you have a cuppa coffee to dip them in. These scones, however, will not last through the day unless I am physically restrained from eating them. Oops! Somebody seems to have eaten the one I was writing about! Time to get another and make sure they are all up to snuff. 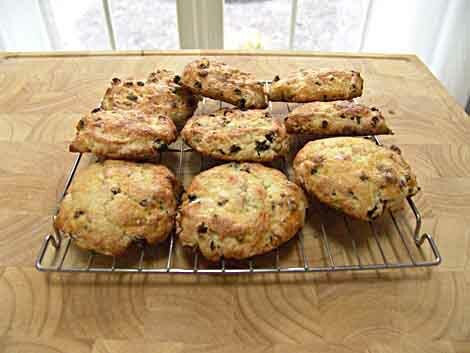 This entry was posted in Country Living and tagged currant scone, scone recipe, scones. Bookmark the permalink. MMMMMM I can almost smell them. Good job, Gretchen!